Jeans for Genesis 2 Male for use in Daz Studio 4.6. 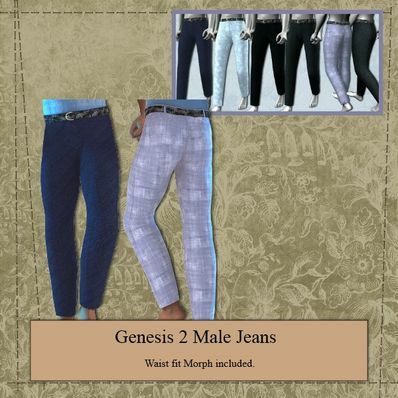 Have converted the Jeans for Genesis to Genesis 2 Male. There was a problem with the normals facing the wrong way on the legs so these have now been fixed. Waist Fit Morph enclosed. I have also included several Textures. Unzip and copy the files to your "/Documents/DAZ 3D/Studio/My Library" folder. Thank you for sharing your skills! File has been updated due to normals on the legs facing the wrong way. Hope it's OK now. I'm among reluctant G2 adopters, (I love Genesis 1) so thanks very much for resources that can get the new models some usage without digging into the bank. Another great job! thank you.